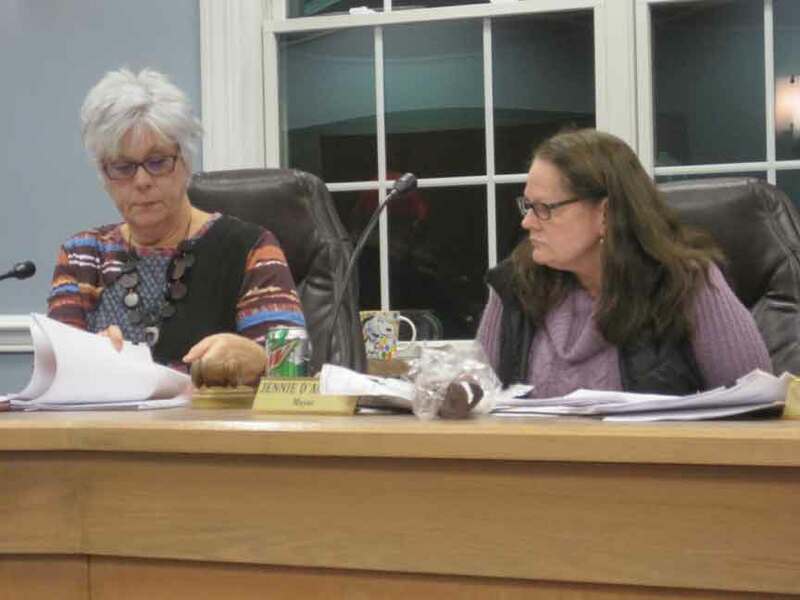 ROAMING SHORES – An announcement that residents are leaving more trash than can fit in their bins at the curb was one of Mayor Jennie D’Amicone’s main topics covered on Tuesday, Nov. 20 during Roaming Shores’ Village Council monthly meeting within the Village Hall.(Nov. 30 edition). According to D’Amicone beginning Monday, Dec. 3 Waste Management Inc. will no longer accept trash unless it is in a container but are offering extra containers for $3 a month for excess garbage. Residents may also purchase special bags at the village hall when dealing with extra waste. After that report D’Amicone gave an update on this year’s Can the Cruiser food drive on Saturday, Nov. 17 in which she said was successful and how they hope to do it annually, noted that they have two sites for Toys for Tots collections that are empty so far and do allow for monetary donations, thanked the first responders and military for their service, as well as wished everyone a happy Thanksgiving. In other news Rome Rock Association’s Liaison, Rory Marshall introduced himself and noted that their dredging meeting was rescheduled for Saturday, Nov. 24 at 10 a.m. at the clubhouse. Roaming Shores Police Sergeant Clay Beck informed everyone that they worked 649 full time hours for the month of October, covered about 87.2 percent of the month because of vacation or sick time being used, noted they received 41 calls for the month of October with 1 criminal trespass call, 2 citations for speeding and zero arrests, used 248 gallons of gas, have 12 seniors enrolled in their check program, plus explained that their new patrol cars were delivered to the dealership to have all of their equipment installed into it. Following a question Beck affirmed that the police department are still offering checks of homes while people are away for the winter or on vacation and require an application be filled out online. For committee reports Marlene Hocevar explained that they held a meeting in regards to planning/zoning on Wednesday, Nov. 7 and passed out information on their recommendations on measurements of garages and bathrooms within garages, along with the regulations in regards to both. Following Hocevar’s explanation several council members questioned why the drain regulations required to be connected to the sewer plant rather than just going into a ditch and Cook said he thought it might have to do with a county code. After their question on the drain issue a public hearing was set for 6 p.m. during Roaming Shores January work session on Tuesday, Jan. 8 in order to address the zoning questions in regards to bathrooms in garages. In personnel news it was announced that a new employee, Bret Pugh was hired for the water and sewer utilities department at a rate of $12.50 an hour, followed by a report from Ed Koziol in regards to SCAD’s meeting on Monday, Nov. 12 in which he offered how they had six calls to the village in October and 103 a year there, 147 calls in the month of October in the county, as well as 1,356 a year so far. Koziol also said that their replacement tax levy passed, that their compensation rates will remain the same and that they renewed their insurance. In utility updates it was announced that there next meeting is set for January. Following committee reports Village Administrator Carl Reinke offered the village’s administrator report in which he highlighted how he had the opportunity to tour the sanitary stations and waste water plant and was informed that the village could sell their water system/sewer system if they wish to do so in the near future. In order to look into this Reinke said he hopes to start small and will be meeting with someone in Jefferson in order to learn the advantages and disadvantages as Jefferson had sold their water system back in the 1980’s. Reinke also noted that there was a request made to purchase an excavator in order for bolts to be dug up and replaced, as well as talked about how he and D’Amicone are having an objective engineering analysis done in order to look at different ideas, costs and investigate in regards to whether to sell or not. In other reports Reinke said that the lift station is about 90 percent completed and the entire Cherry Wood Wastewater Project is about 85 percent complete, noted two new water lines that were installed and two sewer lines, completed exercising Forman Road 12 inch water valves, purchased an order for Easton to install a new catch basin that he said is currently underway, removed the flowers and bushes along Roaming Rock Boulevard as they are hard to maintain, issued two permits and one stop order on tree clearing that he said was able to start up right away after a quick completion of an application, as well as registered one contractor. In visitor’s comments John Ball asked about if the dam will be draining one foot a week which they are, asked for a copy of the jetter agreement which they will be looking into, asked about Reinke’s engineering analysis which he said can be done through an assistance program that offers that info, commented on how garbage cans left out look bad in the community, as well as encouraged that people look into being members of SCAD for the year. Holly Mayernick also spoke about how they should further discussed money being moved around with ordinances more publicly which Koziol said will be done at future meetings and Doris Karver spoke about everyone using microphones so that she can hear better. She also encouraged the police department to be knowledgeable about their ordinances in regards to a burning issue that was allowed even though it shouldn’t have been. The treasurer’s report was approved, the minutes from their Oct. 16 and Nov. 13 meetings were approved, along with an approval of the bills for payment. From there Ordinance 707-09-18: Rescinding Ordinance 451-10-17: Appointing Clerk-Treasurer as Designee for all Elected Officials for Purposes of Education passed, Ordinance 711-11-18: Approving the Permanent Appointment of William Roskos as Police Chief passed as an emergency with a suspending of the three reading rule, Ordinance 713-11-18: Approving the Permanent Appointment of Clay Beck as the Police Sergeant passed as an emergency with a suspending of the three reading rule, Ordinance 713-11-18: Invest Sewer Reserve Funds in General Fund Debt with noted for $50,000 was given its first reading, as well as a first reading for Ordinance 714-11-18: Advancing Funds for the Sewer Reserve Account and General Fund to Village Hall Debt Payment. Pictured: Clerk/Treasurer LeeAnn Moses and Mayor Jennie D’Amicone discussing business on Tuesday, Nov. 20 during Roaming Shores Village Council meeting within the village hall.